How can you improve the flow in a large commercial building? How can you as an individual find your way around better in a large building? How can you find you friend in a large building? From the safety and security perspective – how do you know, when the building is empty, and where the remaining people inside are located in case of an evacuation situation? A total of 15 teams took the challenge, building very imaginative and extensive solutions. You can find the whole listing on Devpost: https://junction2017.devpost.com/submissions/. Out of all the projects, there were two teams that really caught our and Kone’s attention. Something really remarkable about these projects is that instead of thinking about the technologies and intelligence that could be built with it, they both started from the end user, and how they experience the visit at a large, commercial building. Technology for them was just an enabler, happening in the background, nothing that had to be highlighted too much to the user themselves. Here are the projects that got 1st and 2nd place in the “Unleashing IoT in commercial buildings by Kone” challenge. Team Embrace got their name from the cuddle you give to a friend or a relative that you have not seen for a long time. Their project is a very clever take on the much discussed topic – indoor wayfinding at airports. However, instead of focusing on guiding the passenger around the shops and restaurants and finally to the right gate, they turned their focus on the neglected people at the airport – the people waiting at the arrivals. Your mother, brother, auntie, husband or private coach driver waiting for your arrival has no idea how long it is going to take you to walk out of the arrivals door. By utilizing indoor positioning, the system can track travelers as they progress through the stages of checking out at the airport. 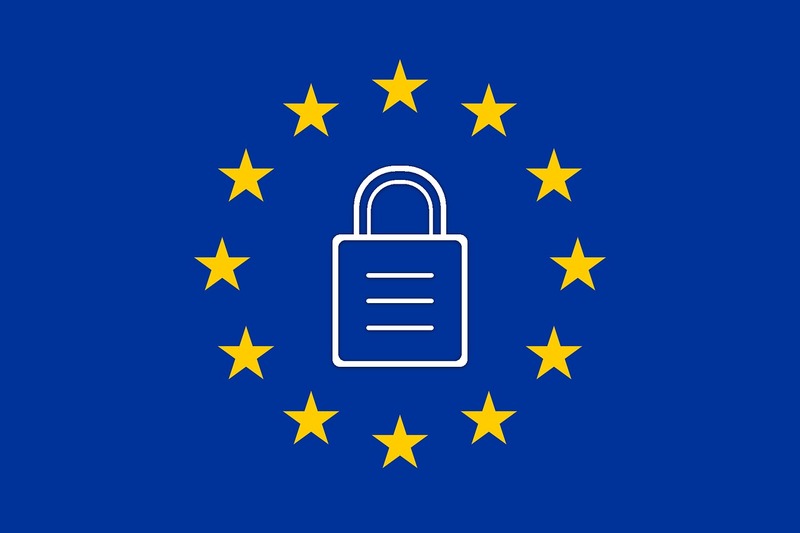 It accesses the geographical location of a traveler via several location services (beacons and IndoorAtlas), through a pre-installed app that the traveler has installed on a mobile device, and which synchs the data to the cloud. The traveler can choose who to share their location with through a link via social media or a text, after which the real-time location of the traveler can be viewed in an instant Android app or web app. Through geofences, the system can basically determine whether someone is at customs or already at the luggage claim. The embracers now know how long they will have to wait at the arrivals hall, making their experience less stressful. In the meantime, depending on the location, the app could show advertisements from the shops at the airport, generating extra revenues to the airport. Full project info: https://devpost.com/software/embrace. – Very fresh look at an old topic – airport wayfinding. – A lot of though put into the end user experience. 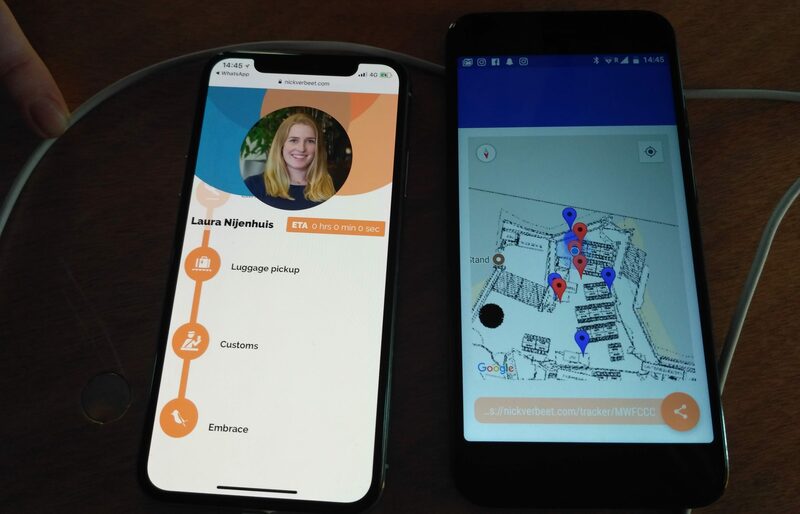 Utilizing a clever combination of a mobile app and web app, which allows the embracers to see the passenger’s position without downloading anything on their phone. How team Embrace describes their experience at Junction: “At first, we actually had difficulties specifically about which track suited our ideas best. We were doubting between Finnair and KONE for a fairly long time. Once our belief in the added user experience of embracers skyrocketed, we figured out that this is a matter that can impossibly be regulated by a flight agency alone. After this argumentation sunk in, it became clear to us that KONE had the right challenge for us. We’re really proud of the fact that we pitched the concept to many mentors at Junction and most of them had never heard of functionalities focusing on the embracers before. All existing apps and concepts are about the traveler and increasing the smoothness of his or her travel. Therefore, we knew we had a great unique selling point. And even though we know that Embrace is not a huge step in terms of technology, we know it does increase the user experience of embracers and it generates more income for airports. Both socially and economically, it’s a win-win! 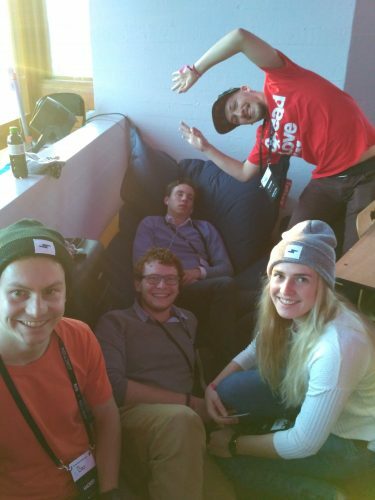 Embrace team: Laura Nijenhuis, Bas Schleijpen, Thijs Koppen, Bert van Gestel and poor Nick that fell asleep after coding the whole night. 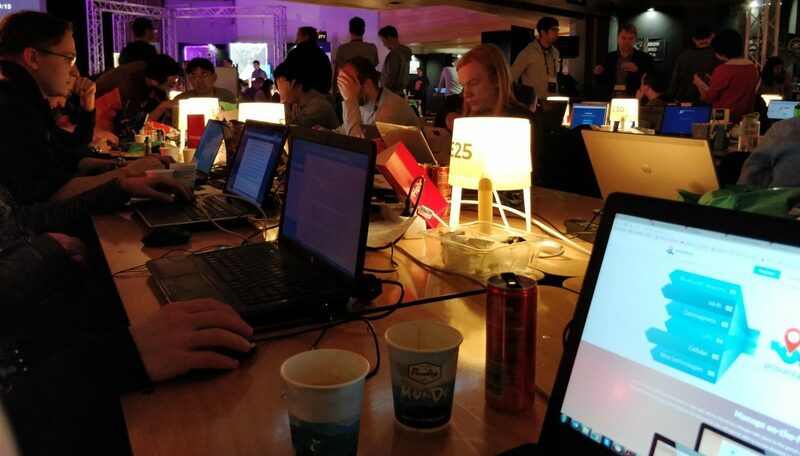 The team team consisted of Dutch students and entrepreneurs from Eindhoven, brought together by Dutch Coding Company. flowPro has also the end user in their focus. Their project was about turning one action to a chain reaction, that enables the end user to move to her destination effortlessly. For example, a person entering into a building is recognized, the correct electronic gates are opened for her, the elevator is directly ordered to the right floor, and her door is unlocked as she approaches it. As the identification happens through their mobile phone, the end user does not need to worry about carrying along their access tag, and it takes them less time to move around. But the real value comes from the info, that flowPro provides to Kone and facility managers. The sooner accurate info about people moving needs and building utilization levels can is collected, better and efficient operations can be planned. The need for cleaning, ventilation and maintenance does no longer need to be estimated, but can be predicted from the data collected in the background on that solution. Furthermore, it allows Kone to connect with the building end users directly, outside of the elevators and escalators. 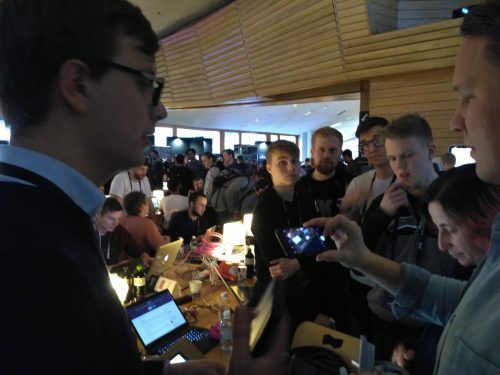 – They took the challenge very seriously, and spent a lot of time discussing the business and technical aspects of their project with the Kone and Proximi.io teams. 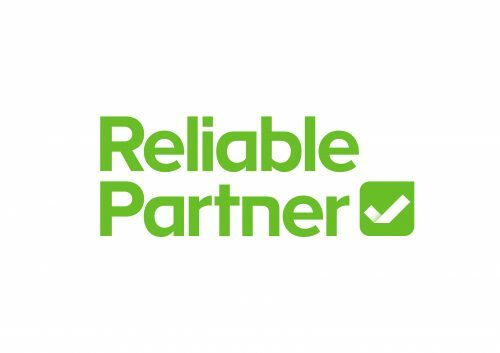 – They took full benefit of the Kone API and Proximi.io platform. The project was definitely not left on mockup stage, but all the integrations were actually built to work through the Proximi.io action flow functionality. – Polished demo. The team had obviously put a lot of effort in ensuring that the demo is as smooth and well-functional as possible, including a digital screen that demonstrated permissions given and denied. 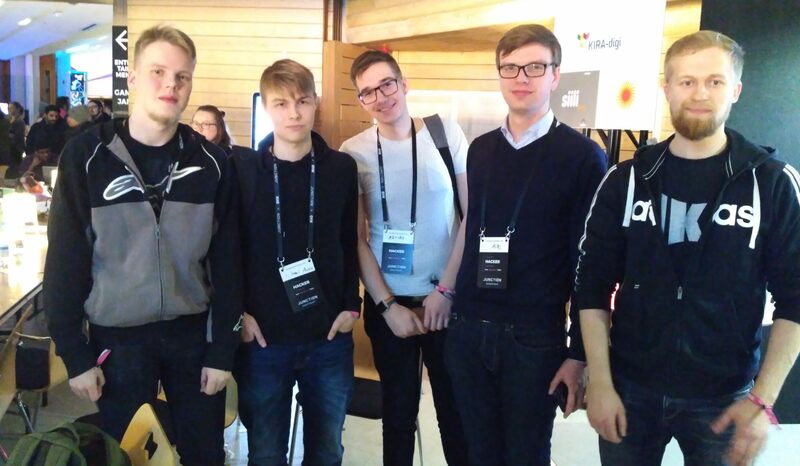 How team flowPro describes their experience at Junction: “For most of us this was the second time participating in Junction so we knew beforehand how awesome it would be. And we weren’t disappointed! When we initially discussed about different challenges we thought that we can provide most value to Kone. By this I mean that Kone is an interesting company as it has a long history and can be seen as a market leader on its business area, but the end user interfaces and user experience have not evolved too much in the last 5-10 years. We got a hang of what Kone was looking for faster than expected so we had plenty of time to build the demo. flowPro team: Matias Järvilehto, Lauri Mäkinen, Miika Avela, Atro Lähdemäki and Sami Autio from Jyväskylä University of Applied Sciences and Aalto University. Congratulations again to both teams, and thank you to all teams who participated in the challenge at Junction 2017! Cool post Annina! I think we had a good collaboration going over the Junction weekend. I wanted to thank you and Kalle for coming there, installing the beacons together with IndoorAtlas and making sure everything was ready for the hackers to use. Also for all the support you provided, giving the training (even if the setup was a bit ad-hock-ish! ), helping the teams and making sure the positioning service kept running smoothly. It is interesting that both the winning teams used the indoor positioning services provided. For me, it was a great experience and I look forward to future collaborations. Thank you, Marta! It was a great experience, and we are looking forward to future collaborations as well!